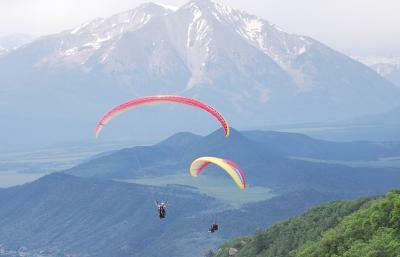 Soar over the Rocky Mountains of Colorado by going on a Frisco paragliding ride. You will experiene the thermals like a bird and the best Frisco, Colorado memorabSoar over the Rocky Mountains of Colorado by going on a Frisco paragliding ride in the area. You will experiene the thermals like a bird and the best Frisco Colorado area memorable mountain experience. You don't need experience one of the certified guides will fly you tandem with your safety first and foremost in their mind. Colorado paragliding truely a unique adventure.le mountain experience. You don't need experience one of the certified guides will fly you tandem with your safety first and foremost in their mind. Colorado paragliding truely a unique adventure.